HARBIN - At 3 am, when the night chill takes away the last warmth of the day, Ma Changlong walks gingerly out of his home in Zhaodong city, Northeast China's Heilongjiang province. The 43-year-old farmer jumps on a truck bound for Harbin, 50 kilometers away, where the ice on the Songhua River is waiting for him. Over the past seven years, Ma has spent 15 days every winter cutting blocks of ice from the frozen river, which are then transported to Harbin where artists carve them into various sculptures to transform the city into a dreamland. "Most villagers stay at home playing mahjong whenever the slow farming season comes. Some even lose their hard-earned money gambling," Ma said. "But look at me, I have this ice-cutting job. Only spending half a month each winter, I earn the same amount of money that I would for several months on the farm," he said. Ma and his family farm a half-hectare plot in a village in Zhaodong, which brings them less than 8,000 yuan ($1,200) a year. The family can hardly make ends meet because Ma has to pay more than 10,000 yuan a year to cover their two children's education fees. However, by cutting ice, Ma makes about an extra 5,000 yuan each winter. "I'm so lucky to find such a good chance to earn money. Though the working conditions are tough, I can finally afford the tuition fees next year," Ma said. To save hotel expenses, Ma travels between his home and the Songhua River every day. Usually he leaves at 3 am, spending two hours in a truck he rented from a fellow villager, cuts ice on the river from 5 am to 6 pm, then spends another two hours on the bumpy road. In -20 C temperatures, the nippy river wind blows through Ma's cotton-padded jacket and ice-cold water splashes on him, forcing Ma to take an extra jacket to avoid freezing. "To protect yourself from cold is of prime importance for this job, otherwise you can neither cut ice anymore, nor make money," Ma said. This year, ice-cutting posed a special challenge to workers like Ma because the 27th Harbin International Ice and Snow Festival, which needed about 180,000 cubic meters of ice for the theme park, opened for trial operation on Christmas Day, earlier than in previous years. The intense schedule also rushed the 2,000 ice cutters on the river surface, who worked overtime for half a month to haul 300,000 cu m of ice out of the Songhua River - enough to fill 134 Olympic-standard swimming pools. "Not everyone can do this, you have to have a strong body, and you have to be quick and skillful," Ma said. "And above all, you can never do it all yourself." All members of Ma's 10-man team are from his village, and work well with each other, which is "essential for ice cutting", Ma said. Each block of ice is about 80 cm wide, 40 cm thick and 160 cm long, and weighs about 460 kg. They sell the blocks for 2.05 yuan each, and Ma's share comes to 250 to 300 yuan a day. But first, the team needs to locate the right place near the riverbank, where the ice is about 40 cm thick. Then they fix an iron rod on the bank and tie a rope to it. The other end is attached to the waist of a worker who stands on the ice and uses a sawing machine to cut out a large block. When the block is about to come loose, they attach it to hooks and then use a towline to lift the slab onto the bank, where it is cut into the required size and taken to the buyer's truck. Members of the team take turns every few hours doing different types of work. "There are several rules of thumb. First, don't go to the middle of the river because torrential water under the thin ice can be dangerous," Ma said. "Nor can you use the ice within five meters of the bank, because it's always filled with silt," he continued. 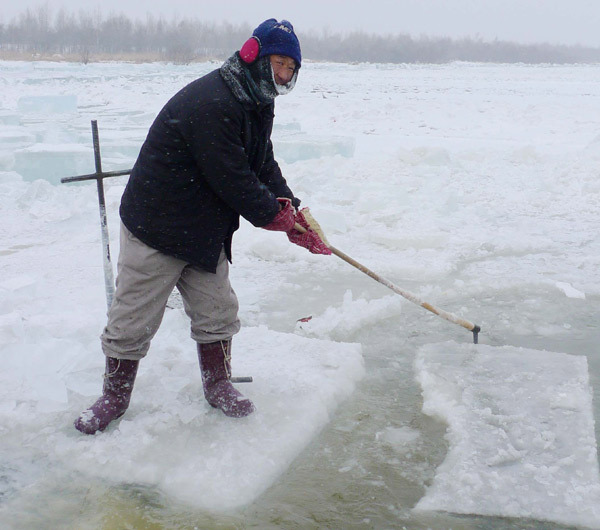 Moreover, the worker with the electric saw can never cut along the direction of the current - unless he wants to cause the ice surface to collapse and fall into the water. "If the worker doesn't cut it right, all the other workers would be in danger. Furthermore, although we tie a rope on the cutter, the freezing water and heavy clothes on him are still extremely dangerous if he falls into the river," Ma said. But he also said he has never heard of any accident of this kind over the past seven years. There is an unfortunate side to the story, however. Though Ma and his team gather all the ice that is carved into elegant structures during the festival, Ma can't afford the 280-yuan ticket to enter the park. "I do not really want to see the sculptures. I prefer to use the money to buy new clothes for my daughter," he said. Wei Zhongwei contributed to this story.